I bought this from John Rivers. He and his son built it, but never flew it. It originally had a Cox Black Widow .049 on it, but it needed more power so I replaced it with the exhaust throttled Cox TD .09 shown in the picture. 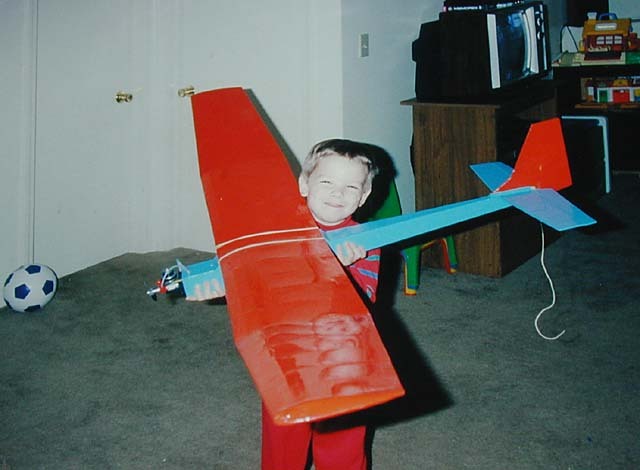 This was the first plane Eric flew. Within a couple of years Steven had a couple of flights on it too. But it was completely destroyed when he put it into a steep dive and I quickly pulled it out. The wing folded and it came down hard. The wing failure was due to an insufficient leading edge repair after a	previous crash.